Dyes represent an extreme environmental hazard and are extensively found in the waste water of industrial discharges. Therefore, the fabrication of an effective photocatalyst for the degradation of pollutants is necessary. In this work, the photocatalytic degradation of methyl orange (MO) in aqueous solution under UV light irradiation was investigated using zinc oxide (ZnO) nanoparticles that were chemically prepared by the sol-gel technique. Several analytical tools, such as X-ray diffraction (XRD), scanning electron microscopy with energy dispersive X-ray spectroscopy (SEM/EDAX), transmission electron microscopy (TEM), nitrogen adsorption and infrared spectroscopy (FT-IR) were utilised to investigate the morphology and composition of the synthesised nanoparticles. The sharp intense peaks of ZnO confirmed the good crystalline nature of ZnO, and EDAX analysis revealed that the fabricated ZnO nanoparticles were comprised mainly of zinc and oxygen atoms. From the TEM and SEM analyses, it was observed that the ZnO nanoparticles exhibited a spherical shape, and the surface area of the catalyst was measured to be 42.12 m2 g_1. The photodegradation experiments demonstrated that the ZnO bleaches MO upon exposure ultraviolet light (UV) and the colour irreversibly changes from orange to colourless. 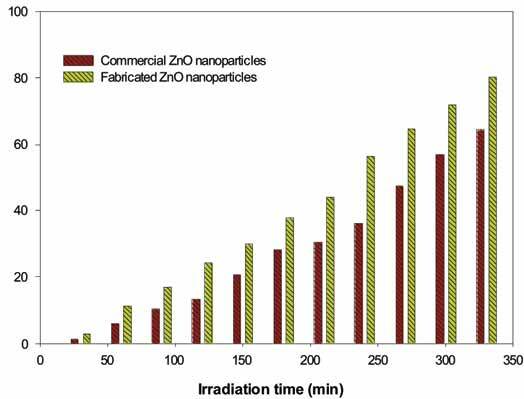 The results obtained revealed that the fabricated ZnO powder (80.11% MO removal) had a better photocatalytic activity than the commercial ZnO powder (64.30% MO removal). The photocatalytic decolourisation of the dye followed a first-order kinetics, and the observed rate constant values changed with the MO concentration. The development of this photocatalyst can be considered a breakthrough for the large-scale use of photocatalysis to solve issues around the contamination of water and to address serious environmental pollution problems. Zinc oxide, nanoparticles, sol-gel, photocatalytic degradation, methyl orange. Chemistry Department, Faculty of Science, Taif University, 888-Taif, Kingdom of Saudi Arabia.